This has been a very important, sobering experience today. I am very humbled by it. I am very humbled by the great honour and responsibility that has been given to me today. We need to have in this country, and we will have now, an economic vision, a leadership that explains the great challenges and opportunities that we face. ...This will be a thoroughly Liberal Government. It will be a thoroughly Liberal Government committed to freedom, the individual and the market. It will be focused on ensuring that in the years ahead, as the world becomes more and more competitive, and greater opportunities arise, we are able to take advantage of that. The Australia of the future has to be a nation that is agile, that is innovative, that is creative. His primary vision is of the freedom of the individual in the market. It's an exceptionally limited view of man and his purposes. However, it is hard to deny that Malcolm Turnbull has an extraordinary life story. We have an election campaign running in Australia at the moment. For a while the Labor opposition chose to attack Turnbull as being an out of touch, born-to-rule type. That's a little odd for two reasons. First, the Labour leader, Bill Shorten, is not exactly a battler type himself. In 2009 he married the daughter of the then Governor-General of Australia. And he went to school with me - at Xavier College, not exactly part of struggle town (I don't remember much about him at school). Second, Malcolm Turnbull was not exactly born with a silver spoon in his mouth. His mother, Coral Lansbury, abandoned the family when he was nine-years-old, choosing to live overseas, first in New Zealand and then in America (she was a second cousin to the actress Angela Lansbury). She became a thrice married socialist feminist academic and novelist. And so Malcolm Turnbull was left to be raised by his father, Bruce Turnbull. It would have been easy for his father to sink, and for a while father and son lived in modest circumstances in Sydney. But his father battled his way through what must have been a personal tragedy and in later life became successful in his career field. He not only kept himself going strong, he also raised alone as a single father a future prime minister. Malcom Turnbull speaks of his father (who died in a plane crash) with great admiration as someone who loved him and who dedicated much of his life to him. “I wouldn’t be where I am today without my dad,” reveals Turnbull. Which is actually true. Indeed, Malcolm wouldn’t be anything without his father… sperm being a fairly vital component in the formation of all humanoids. There's also been a twitter campaign based on the tag #MalcolmWasSoPoor making fun of Turnbull's life story. Maybe I'm just not ruthless enough and I should take any chance to stick the knife into my political enemies just like the leftists do. But I can't do it in this case. Father and son got through something together that must have been crushing for both. I admire the dedication of the father and the willingness of both father and son to overcome personal adversity. I don't see why this can't be acknowledged. There is another dimension to this story. Turnbull is a Scottish clan with specific traditions which Malcolm's father obviously observed. 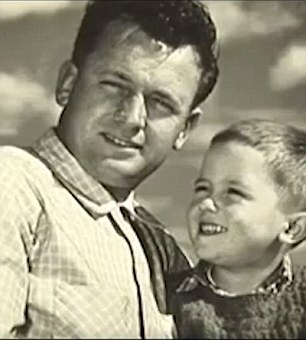 One is the strong bond between father and son (who often have the same first names and family traditional middle names - in this case Bligh - passed to Malcolm's own son through family lines). The father is responsible for grooming the son to achieve education and then wealth and power through planning, effort, self control, diligence and advantageous marriage. The difficulties of their situation after the mother left probably strengthened their resolve, determination and sense of purpose to achieve these goals and prevented them from declining into complacency and indifference. Their tragedy united them to each other and to their tradition. It's a story of a man's selfless devotion to his son and his son's strong devotion to and admiration of his father. The picture shows it. However the strong bond of father, son and family Turnbull tradition and ancestry is one that the left hates so will do everything they can to destroy it. The left hates strong people and worships victims. They do not want the public to have such stories as examples or such role models to be emulated. In fairness, his opening address that you have included above seems to indicate a limited view of government and its purposes, not an entirely bad thing by any means. This attitude does not necessarily exclude a broader view of Man. Turnbull is, as you say, a right-liberal. Personally I consider right-liberals to be more contemptible and far more dangerous than out-and-out leftists. I wouldn't vote for him under any circumstances. But even people who hold thoroughly evil and destructive beliefs can be, on a personal level, perfectly pleasant and even admirable human beings. Being wrong doesn't make you a monster. I'd shake Turnbull's hand but I wouldn't vote for him. Having said that, I think the overall moral standards of politicians are so low that I find it difficult to feel much sympathy for any of them. I've met quite a few. Some are very nice people. But I wouldn't trust a single one of them. There's something missing in them. "Maybe I'm just not ruthless enough..."
That's why I have a sneaking regard for the Alt Right. They do the dirty work so decent men don't have to. Who is the most privileged in America?